Every inner nerd needs to be decorated. 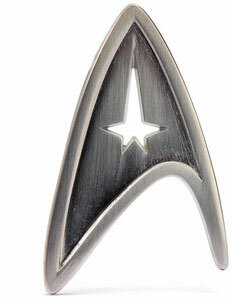 To that end, here’s a Spot Cool Stuff selection of ten pieces of jewelry that are geeky but may also—depending on your point of view—look cool. The planet is has an increasing supply of used computers and there’s no comprehensive plan for what to do with them. 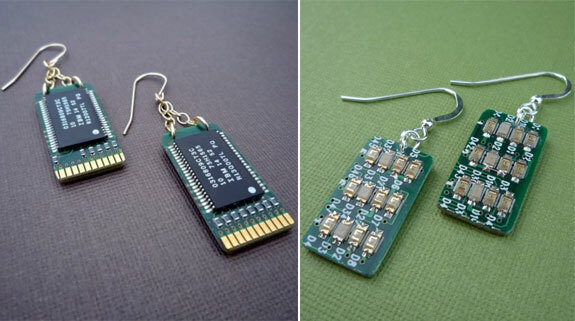 But the Etsy artist group Sparkover has one way of using at least some of the inner workings of these discarded electronics: they turn them into circuit board jewelry. Earrings, pendants, rings . . . you can even get a disturbingly interesting circuit board mustache. 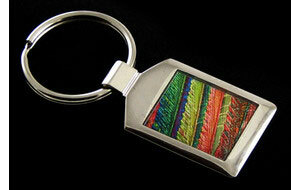 To casual observers, the items in these black-backgrounded photos contain colorful abstract works of art. But a microchemist may recognize what they really show: macro photos of molecules. Caffeine molecules, to be specific. At least that’s what’s shown in our examples. The Molecular Keychain and Molecular Cufflinks also come in Testosterone, for that especially manly vibe. Options for the Molecular Earrings include Dopamine, the happiness inducing neurotransmitter, and the anti-depressant Serotonin. 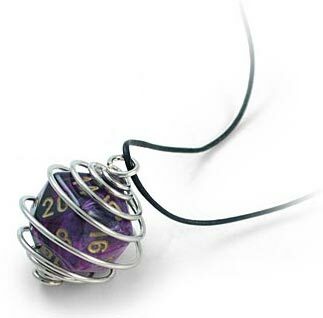 You needn’t be a level 10 Druid to wear a d20 Spiral Necklace. Anyone can don this adjustable piece of neckwear (though it would greatly help if they at least knew what a level 10 Druid was). Inside the stainless steel pendant is a removable 20-sided die, perfect in case a Dungeons & Dragons emergency should arise. In ancient Greece the asclepius wand was a symbol of power. In medieval times a crown denoted power. 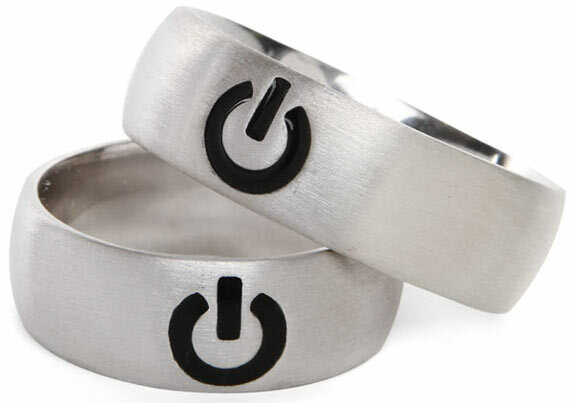 In the current computer age the symbol for power is a semi-circle with a line through it—like that depicted on the Power Ring. 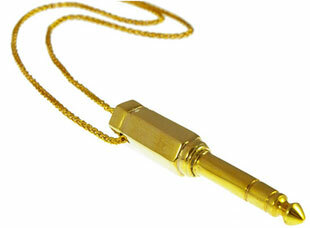 The Jack Plug Necklace is a cool design that some high-end DJs consider a required fashion accessory. The particular necklace pictured to the right has a jack plug pendant that’s 24-karat gold carat plating. Still, instead of spending $310 for this piece of jewelry we’d rather get a pair of real Dr. Dre headphones—they also come with a gold-plated jack plug but you also get a pair of headphones attached to it. Instead of wearing your love for cell phones on your sleeve how about wearing bits of a cell phone there? 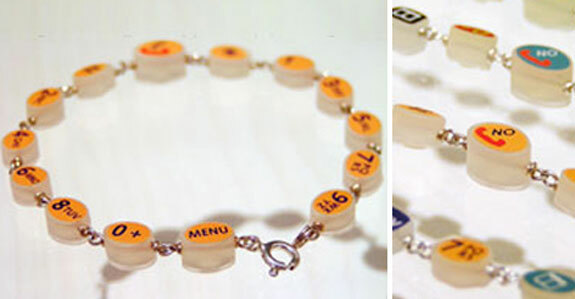 The Handy Bracelet is decorated with keypad buttons from discarded phones. We like that the menu and power buttons are included in addition to the numbers. Currently discounted 50% to $20. 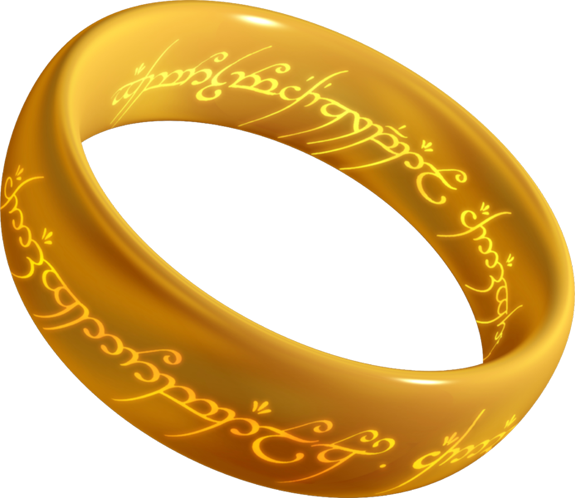 In the Lord of the Rings trilogy, what was somewhat lost amongst all the orc fighting and fellowing forming is that the ring at the center of the story was quite an artistic piece of jewelry. As any self-respecting Lord of the Ring fan knows, the characters on the top and inside of the ring are ancient Elvish and, translated, mean One Ring to bring them all and in the darkness bind them. 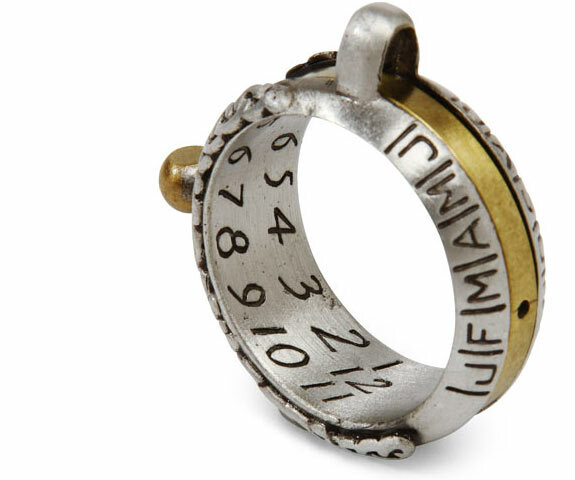 Not the most cheery sentiment to wear around your finger or at the end of a necklace. Still, the ring is cool-looking. My precious is available in gold or silver. Throwing it into the Fires of Modor is strictly optional. My husband will absolutely love the Lord of the Rings ring. He is a massive fan. What a great find! Nice showcase!I really enjoy to visit your great presentation keep it up.. 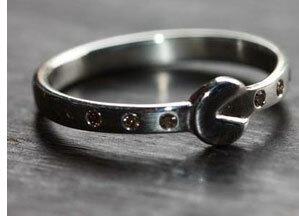 Some of these rings are beautiful and I’d love to receive one as a gift. If I had to pick one, it’s be the Lord of the Rings Ring. 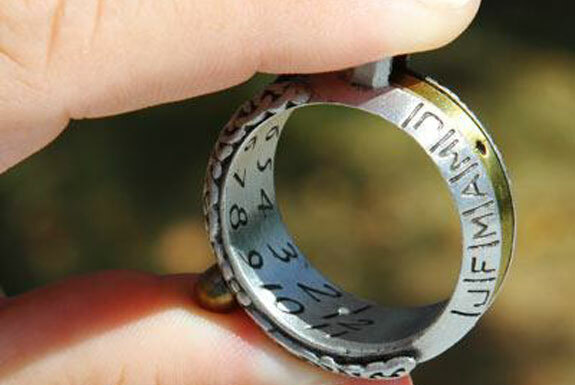 I’m not a fan of the series, I just love the Elvish text running through the ring!